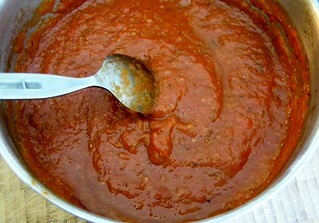 Roasted Heirloom Tomato Sauce | What Smells So Good? 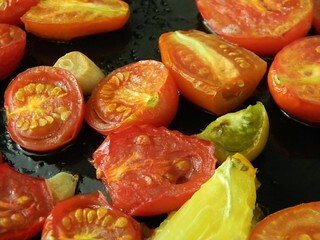 Place the tomatoes (cut side up), onion pieces, garlic and thyme leaves in a single layer in a baking dish. Roast for 45 minutes, gently stirring halfway through. Pinch the peels off half the tomatoes (this should be fairly simple if the tomatoes are beginning to blacken), then puree the mixture in a food processor or blender and pour into a pot. 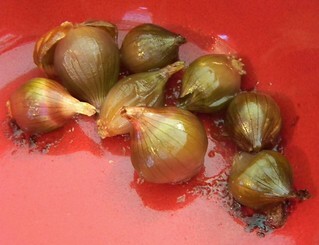 Place over medium heat and stir in the wine, broth, basil, mustard powder, paprika and Kosher salt. Simmer for 30 minutes. Taste and adjust seasoning. Serve immediately, can (45 minutes in a waterbath canner) or refrigerate in a sealed container up to 2 weeks.